If you have the skills, tools, and experience, then it will be easy for you to repair a leaky roof. Today, manufacturers create roofs that are designed well and made of materials that can stand up to the severe weather conditions. However, that does not mean that they will last forever. Over time, your roof will wear down and you will eventually encounter some problems and a roof leak is one of them. Listed below are five of the most common indications of a roof that has been weakened by the storm. 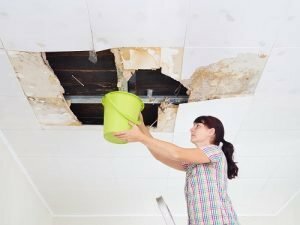 You will also find a list of temporary solutions that you can take as you wait for the roofing contractor to arrive and do the proper roof repair. If you notice signs of roof discoloration during a massive storm then that means there is a leak. In case the bad weather continues for a few days more, there is a chance that the leak will grow bigger, which would mean a large amount of water will penetrate your internal ceilings. This will eventually lead to ponding in the internal underlayment that is protecting your ceiling. If the rain persists, the underlayment will be overwhelmed and lead to dripping along the areas of the internal ceiling. Once the rain passes, you should perform an emergency roof repair to avoid further damages. One sure sign of rain penetration is the presence of puddles. If you notice your flooring has started become moist, then there is a small leak in your house. Puddles indicate that there is significant internal roof damage in the area that is affected. In case the storm continues, you could place buckets in areas where there are leaks to prevent additional floor damage. As a matter of fact, this solution works well especially if you have carpeted floors. You have to perform a standard emergency roof leak repair to prevent the roof leak North Myrtle Beach from the getting worse. Water on the walls will damage its materials and paint. So, you have to check your walls for water torrents. Prevent paint damage by using a dry cloth after each torrent passes. However, it is difficult to identify the roof leaks that are causing the running water. In some instances, roof in these areas does not discolor. But, when you notice rustic stains in the wall, then you have another indication that there is a leak somewhere near. You can reduce the damage on the wall with an emergency roof leak repair. You also need the help of a professional roofing contractor who can perform a roof inspection, roof repair, and offer a solution to prevent water damage in the future. Be sure to inspect your roof especially during intervals of weaker hailstorms or rains. In case you notice significant external roof damage, then you should call a professional roofing contractor who will perform an instant roof leak repair. Call NMB Roofing Pros if you need the help of professionals in fixing your leaky roof.